The Uk's Number One Online Lawn & Garden Equipment Spares Supplier Simply Garden Spares is, quite simply, the UK's number one online supplier of garden equipment spares. We aim to make your life as easy as possible by offering an unbeatable range of spares for all your gardening machinery. We know how frustrating it is when you break, lose or damage a much-loved and much-needed piece of garden machinery, so we will do everything we can to help you locate the correct replacement part, and we'll get it to you as quickly as possible. As a specialist retailer of garden machinery spares, we certainly know our stuff. Our friendly and knowledgeable staff are always delighted to answer any queries you might have about the items we stock, and we can point you in the right direction if you aren't quite sure what you need. Whether you need lawn mower parts to fix up a faithful old mower, garden strimmer spare parts to repair damage to your strimmer, or replacement hedge trimmer spares so you can neaten up your garden hedge, we can help. We stock a huge selection of spare from all of the UK's favourite garden and agriculture brands. 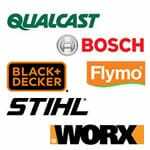 We are proud to be official stockists of spares from such respected brands as Flymo, John Deer, Black and Decker, Bosch, Champion, and many, many more. Not only do we strive to offer you the biggest selection of garden spares, we also aim to do it at a reasonable price. We try our best to keep the cost to you as low as possible, so take a look at some of our offerings - you might be pleasantly surprised. 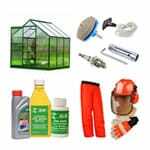 As well as stocking a huge selection of garden machinery spares, lawn mower parts, garden strimmer spare parts and replacement hedge trimmer spares, we also carry a wide variety of other products, including oils and accessories, and greenhouse maintenance supplies. 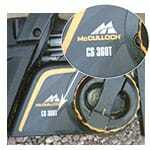 We also stock a number of safety accessories to help you protect yourself while you work in your garden. If you've got a project underway or you need to get a job done before a deadline, you'll be pleased to learn that we pride ourselves on our fast order processing and delivery times. We offer a range of delivery options, meaning you can have your garden spares ready to use in next to no time. One of the worst things about shopping for spares is not only finding the exact part you need, but weighing up all the different benefits and disadvantages of individual suppliers. We take away all the hassle of shopping for spares by stocking the biggest and best selection you'll find anywhere, and promising professional service and prompt delivery. Get in touch with our helpful, professional team today and let them help you find what you need. We deliver garden spares and agricultural bearings both internationally and nationwide from the Scottish Highlands, Midlands and South making bearing and spare parts buying in the UK online simple, no more fishing around for parts for lawnmowers/lawn rakers, hedge trimmers, grass strimmers, garden vacuum, chainsaws, greenhouses or farm machinery. We sell agricultural bearings for tillage, seeder, combine harvester, baler and lawn machinery. We also offer a wide range of replacement garden spares for the domestic user.